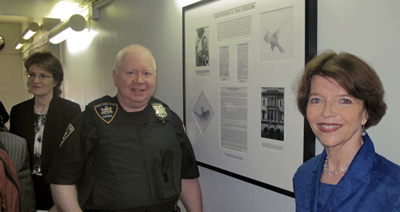 On July 24, 2014 the tribute W.C. Fields and Justice was unveiled at the Midtown Community Court, West 54th Street, New York City. Lessons for all today—Alan Mass, attorney for Judge Mennin, is to be credited for his and Judge Mennin's insight into establishing this tribute as lessons for us all. Judge Felicia Mennin on left honoring the lessons of the case, center Court Officer now praised for justice, on right Dr. Harriet Fields, granddaughter. Background shows the tribute W.C. Fields and Justice. Before William C. Fields became the renowned film comedian W.C. Fields of the 1930s and 40s, he was a major Broadway revue star. 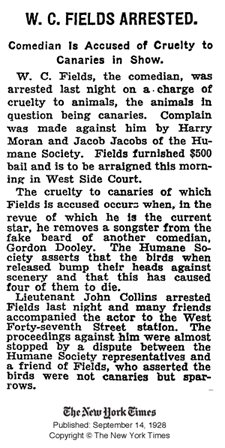 On September 13, 1928, he was arrested at the theater on a charge of cruelty to animals, the alleged victim being a canary which he used in a scene. The canary was seized, exhibited to reporters and photographers on the steps of the police precinct. When the police arrived at a veterinarian's office the canary was dead. Fields went to trial the next day at the Seventh District (West Side) Magistrates' Court, the same building in which the Midtown Community Court is now housed. He was found not guilty by The Hon. George Simpson in a scathing decision (see below). THE COURT: The Defendant is charged with having carried the bird in his pocket, that he took the same from his pocket, permitted the bird to fly upon the stage of the Earl Carroll Theatre, and this bird struck the scenery, causing the bird to fall to the floor of the stage so as to produce torture. 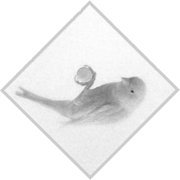 There is not a scintilla of proof that the bird was tortured. On the contrary, from the experience of Mr. Fields with five or six birds in this very act, and the testimony of Mr. Cassidy who has been more or less for thirty years attending birds in his family and for his mother, and in this very theatre, having testified that he fed them and took care of them, the only bird that died is the bird before me. There is absolutely no proof that this bird suffered any torture or unjustifiable physical pain. There is not a scintilla of proof as to that. We have a dead bird here before me in a cage. How did the bird die? On the testimony before me, I am satisfied that this bird did not strike the scenery at all. This bird flew out in the audience, as this bird and other birds have done in this theatre, according to the undisputed testimony, for many a night. The bird flew out in the audience and back to the stage. The bird did not suffer by being in this tremendously large-sized pocket which has been exhibited in this Court, by Mr. Fields, before me. Nor did the bird suffer by being brought in contact with a beard because it is denied by the man who held the bird, Mr. Fields, that he ever touched the beard. So that there is nothing in the act of Mr. Fields in taking the bird, holding it in his hand in this pocket while he took two steps, and then took the bird in his hand, placed the bird under the beard of some individual. I am satisfied the bird few out in the audience and flew back. The best proof is the experience of these other birds, as testified to by the man in charge of them, and who has had more or less to do with birds for more than thirty years. He has testified what the other birds were fed with, and also this bird. The bird was all right, I am satisfied, until he got into the hands of one or both of the officers. This was a case I am very frank to say, that if the proper discretion had been used, Officer Moran would not have taken a reputable citizen and placed him under arrest when he had the right to use a summons. . . . There is no danger of Mr. Fields running away and, in an act that is shown every night, there is every inducement to stay here. He made an unjustifiable arrest of a reputable citizen upon the theory that this bird was suffering torture and, before me, there is not a scintilla of evidence of the bird having suffered torture. Rather, on the contrary, after the bird was taken to the station house, it was there for a while, and it was taken out. It was in a flash-light photograph that was taken by these officers and placed, at the instance of some photographers for some paper, perhaps, and the bird suffered from the effect of the smoke of the flash-light, from the shock of the flash-there is no question in my mind-and died in the cage. The bird did not die from any act on the part of this Defendant, William C. Fields, nor did the bird suffer any torture at his hands, whatsoever. Therefore, I find the Defendant not guilty, and he is acquitted.